It's time to launch your app to the world! In the last lesson you learned how to leverage our marketplace features and some of our core features to build your app and have hopefully even done so. In this lesson, we’re going to talk about how to publish your app. Now, I’ve got to be honest with you, I’ve got some bad news and I’ve got some good news. The bad news is that publishing your app to the App Store for iOS and Google Play for Android is pretty difficult. There are several details you have to follow properly and multiple edge cases you can encounter along the way. 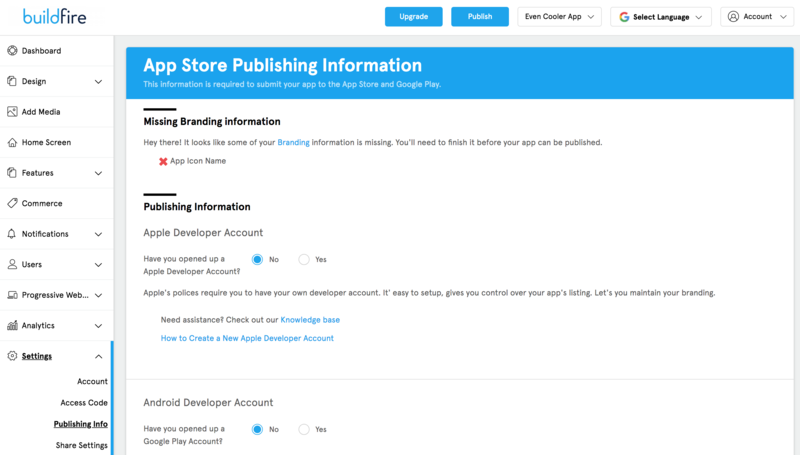 The good news, however, is that at BuildFire, our awesome publishing team will handle publishing your app to both the App Store and Google Play for you! Once you’re ready to publish your app, simply follow these steps. If you want to get the most out of the platform and make your app as robust and engaging as possible, you’ll want to upgrade to one of our paid plans. When you do this, not only will you be able to publish your app, but can also unlock our advanced features such as targeted push notifications, user tagging, and more. Both Apple and Google require that you have dedicated developer accounts that you own attached to your app, but there are some benefits that come along in doing so. You’ll have more control over your app, your app’s listing, and will have the ability to access the backend to get access to things such as analytics. If you have two-factor authentication turned on, you’ll need to turn it off. On some accounts, however, Apple doesn’t allow for it to be turned off. If this is the case for you, reach out to us and we’ll get you squared away. At first glance, this can seem daunting, but don’t worry. There are just a few questions that we need answered in order to properly categorize your app and set up your store listings. To help assist you with each these steps, we’ve put together some dedicated tutorials in BuildFire University. Simply click the links below to access them. Once you’ve submitted your app, our publishing team will take over from here, but there is something that’s incredibly important to be aware of. If your app gets rejected for whatever reason, please let us know. Since you are the Apple Dev account owner, we will not be notified. Simply forward the email you get from Apple to support@buildfire.com and we'd be happy to assist you on how to move forward. Now that you know how to build and publish your app, let’s talk about how to leverage our advanced features to attract your audience and keep them engaged.